This weekend was a bit of a whirlwind. We're trying to purchase a second property in the desert, in Wonder Valley, and so had to stay in Los Angeles Saturday morning to tend to details. We arrived at the CopperMountain Mesa Community Association potluck shortly after 4:00 p.m. to a lovely spread. It was great to see everyone AND it was insufferably hot. My cucumber salad was a flop but Ken's German potato salad was a hit. It’s twelve kinds of delicious - makes me want to throw in the towel, as far as cooking is concerned. We drove home around 5:30 p.m. as the sun began to lose its grip on the neck of the landscape and the heat began to relent. Our neighbor, Michael, came by and brought a spare evaporative cooler. He and Ken tinkered with it until they got it back in working order. Michael had watered our trees while we were gone and composted them with horse manure. We'd caged one of our two jojobas last week. This week the other, uncaged, was practically denuded by rabbits, so we took the cage off a dead Apache plume (encelia farinosa) and put it over the stripped jojoba. I had to put a top on the cage of our desert grape. It looks like the birds may have gotten in to nibble at its leaves. Our two desert willows are thriving, but our desert peaches are having a difficult time clinging to life. After Michael left we pulled the chairs out onto the north patio and watched the sun set. 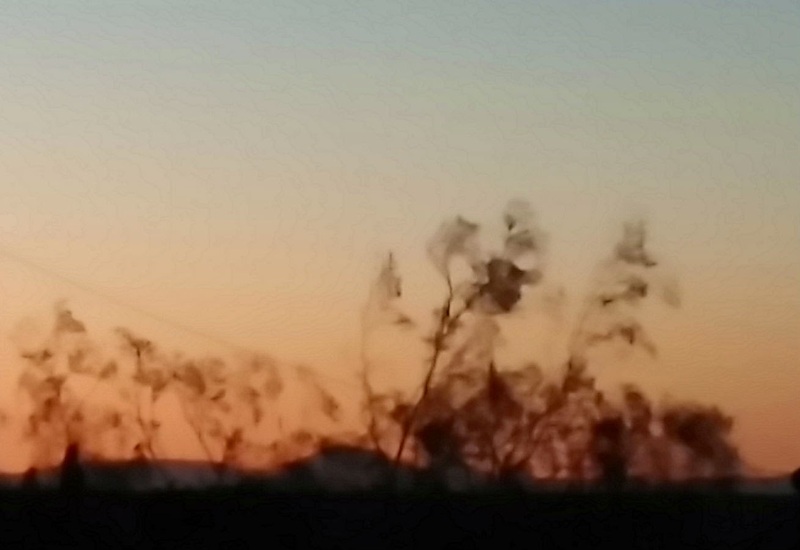 It was unspectacular as there were no clouds in the sky, but still the "assent of dark air"* over the mountain is always relaxing and I took the photo above - larrea (creosote) blowing in the wind at sunset. The next morning we did a few chores, then drove to the Palms in Wonder Valley to meet our new dear friends, Annelies and Jim, for breakfast. Our 14th anniversary was the next day so we brought a bottle of champagne. Laurel and Frank were there from the Glass Outhouse Gallery, and I got to meet Leslie Mariah Andrews, a charming local musician and artist I'd heard so much about. Ben Vaughn, a music curator we usually listen to on our drive back to LA, came in and we got to meet him and hang out. Kip was there and he introduced us to artist Andrea Zittel who flitted in all fresh and powdered like an air-conditioned angel. 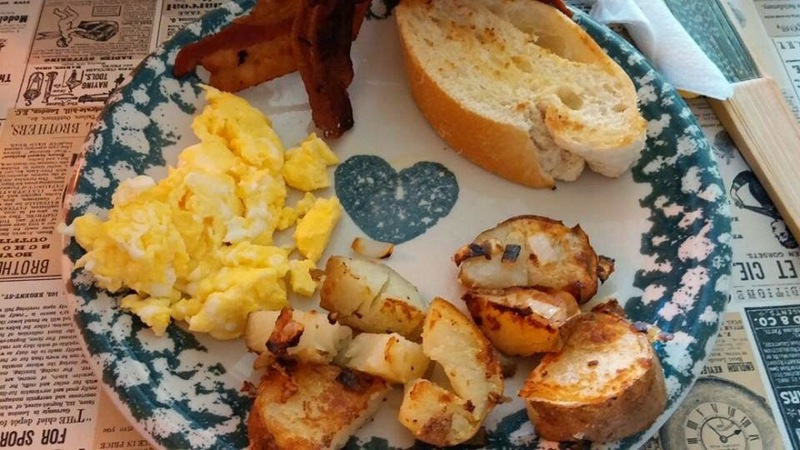 The lovely Laura Sibley made us breakfast and served it on plates with hearts in the center for our anniversary. Sunday breakfast at the Palms has become so special to us. It's probably what church aspires to, but I've never left a church feeling so well fed - body and soul. Annelies and Jim dropped by the cabin a little later and Jim brought shade cloth for my last-gasping peach trees. The bolt was desert beige. We cut two pieces and I sewed up the sides and slipped them over the cages flopping the tops inward. My hope is the break in the sun will give them a chance to grow. Ken was moved by the generosity and ingenuity of our neighbors who are always there to help when we need them. In both cases - with the swamp cooler and the shade cloth, the solutions were far superior than what we could have come up with from a trip to Home Depot. It's wonderful to see how people pull together in such a harsh environment. Maybe needs are amplified and easier to identify in a landscape that offers few distractions. Maybe with commercial services being so far away people have the chance to step in and shine. Living without conveniences has made me appreciate people more. No animal sightings. I’m still on the lookout in the cool parts of the day for tortoises and snakes and tarantulas, but nothing this weekend. * Ken gifted me with Flann O'Brien's image of "dark air" from the book At Swm Two Birds.